Editor’s Note: Still buzzing from his findings on West Coast Tempranillo scene, Louis Villard headed to Paso Robles to attend The Garagiste Festival. There he found a mix of producers using the grape in the traditional and not-so traditional styles. 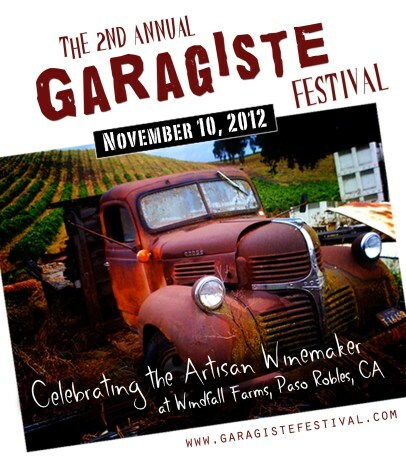 The weekend of November 17th heralded the second annual Garagiste Festival in Paso Robles. This festival is different to most as it celebrates the smaller producers of the wine world. To attend wineries must make 1200 bottles or less a year. One main feature of going to a wine show with small production wineries is that a lot of the hoop-law and fireworks surrounding these events are set-aside. Here you are talking, for the most part, to the person who made the wine, a detail that goes amiss at larger shows. These are also the type of shows were one might get a glimpse or hint of the next trend; perhaps a particular winemaking style, a vineyard developing a name for itself or even the next emerging grape. Of the forty-six producers at Garagiste, four were dedicated to Spanish and Portuguese varieties, a small percentage but perhaps a hint at where the future lies here in the Central Coast. Interestingly enough it was this Iberian front who had the top tier of all the wine at the show. Bodegas M – for instance was a particularly good wine to look out for, winemaker Alan Kinn actually brought his cuttings of Tempranillo from Spain, in the 90’s. Paso Port – as you might have guessed, focus on making fortified port-style wine. What is particularly interesting is they have a ‘field blend’ style of wine, using Portuguese varieties and much like that seen across the Douro Valley. Bodega de Edgar also deserves a mention. Edgar Torres moved to California as a child from Mexico. Through working in restaurants he developed a liking for wine, and eventually did the rounds at few different wineries. He’s making a 100% Tempranillo, Albariño and Garnacha. While Stanger Vineyard although a winery focused on Cabernet, has a Tempranillo lot of 1 acre which was showing very well. Am I a traditionalist for these thoughts? Perhaps, but in my defense I did give the New World blends a chance, and I am sure when blended with Syrah or Merlot, Tempranillo is not at its best. However, when made as a single variety and using the above mentioned producers as my examples, the grape represents itself wonderfully; in my humble opinion, this is the trend we should see more of. What do you think though? Are New World style blends passé? Am I getting old in my ways?